I’m not even sure what I’m supposed to say here. I’ve been taken on an emotional, territorial, regional, and spiritual ride all at once. I’m actually not going to to wax too profuse here, because really, this book is one that simply needs to be read to understand it. This isn’t to say it’s abstract, or hard to understand. Let me put it this way–I have, for the last week and a half, tried to do that at which I am extremely good in person: summing up a book in “blurb form” for others. This one is just too . . . um, see, I can’t even think of a word. Complex does not work, even though it is. The closest thing I could say about it is multidimensional. Reuben Land is an eleven year old Minnesota kid, living in the 60’s. He is born asthmatic. The first thing you encounter, as a matter-of fact, is the “1st person omniscient” recounting of his own birth–one that should have left him and his clogged lungs dead at birth. Over the scientific pessimism of the doctor and the situational agnosticism of everyone else, Reuben’s mysterious father runs in, commands him to “breathe in the Name of God” and causes him to live. “This,” says Reuben, as the “first miracle” he saw his father do. A series of subtle-yet-inarguable miracles take place. Some of them overcoming the impossible while other impossible circumstances are simultaneously unfolding around them (and by them I mean his father, brother, and precocious little sister, Swede, who has a MAD literary streak). Reuben and his compromised lungs see some serious miles, both logistically as well as experientially. And as much as I hate to say it, this will technically go down as the worst book review I will ever forge, because I am stopping there. That description is neither complete, nor telegraphing in any sense of direction. In short: if you want any advice from me–read the book yourself. A perfect novel can be forged against the single backdrop of relationships–something that, if done correctly can make the entire story feel complete, and without a single implied omission. And this is no mean feat. Review dedicated to Ann, who first put me on to this journey. 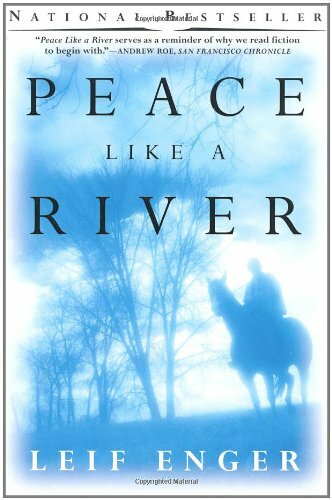 This entry was posted in Blogging, Book reviews, Books, Writing and tagged Leif Enger, peace like a river. Bookmark the permalink.